There is a recently invented trend its pitchmen hope to make a tradition, The Elf on the Shelf. He is a scout who will report back to Santa Claus whether children have been naughty or nice. Is this just an innocuous little add-on to the legend of St. Nicholas? Hardly! The Elf on the Shelf is designed to make current and future generations of American children used to being watched at all times. It is a plot from Big Brother to make the surveillance state seem normal. 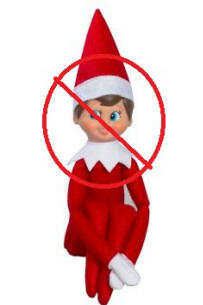 Parents are encouraged to move their little elf around the house from time to time when the young ones aren’t watching. This will make him seem like he’s not just a doll. Also, kids are warned never to touch him lest he lose his elf powers and not be able to work for Santa any more. That is bound to come off as a dare to the one skeptical child in many homes, and leave his or her siblings crying inconsolably. Also, a doll apparently moving will make easily frightened children terrified! It will be as if they have discovered their house is haunted. It is painfully obvious that Washington does not trust the American people. Even worse than politicians are the unelected bureaucrats at agencies like the NSA, FBI, CIA and Department of Homeland Security who view our Constitutional guarantees of privacy to be nothing more than some ink on a piece of paper. They have a goal of making us forget about privacy and personal security, and it has nothing to do with protecting us from crime or terrorism. It is only about power. They invented this diabolical little imp they would have children believe is one of Santa’s Helpers. Do not be fooled. The Elf on the Shelf is bad for your children and bad for America. Do not bring him home for the holidays.